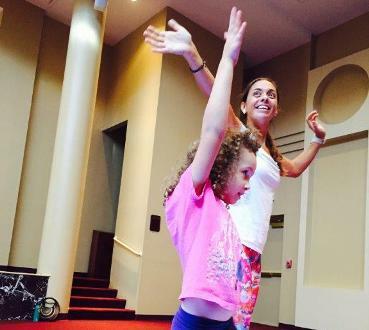 Yoga was introduced school-wide at Temple Beit HaYam Early Childhood Learning Center in Stuart, Florida. The teachers and students visit the social hall and participate in yoga together as a class. The center bought 100 yoga mats in support of this new school-wide activity. What inspired the center to start yoga as an activity is the popularity of yoga as a weight-loss activity as well as a general physical and emotional healthy activity. Yoga allows adult and children to stretch both their minds and their bodies. It is a safe, low-impact activity that fits well into early childhood–plus, you can do it anywhere. The child care providers have shared the results of participating in yoga have been better classroom management, more attentive children and kids who are more aware of their bodies. Yoga has been physically and mentally stimulating and beneficial for all who participate. In September 2014, Florida’s Department of Children and Families’ (DCF) Office of Child Care Regulation and Background Screening kicked off a special challenge to child care providers across Florida through the PREVENT Obesity initiative. The theme, Healthy Options for Obesity Prevention (HOOP), challenged child care providers to be creative with promoting physical activity using hula hoops. These SHAPE America materials provide age-appropriate activities to show the importance of physical activity for young children. They offer a variety of ideas, strategies and information to use the space, material and time that providers or parents have to model and encourage physical activities. They are offered in English and Spanish.